Do you have a son or daughter that plays Pearland youth sports? Soccer, baseball, football, basketball and gymnastics can be very dangerous to your child’s teeth. Football is a violent contact sport, yet there is a relatively low rate of tooth injuries that occur in football as compared to other contact sports. Why? Football players are required to wear a mouth guard and a helmet. 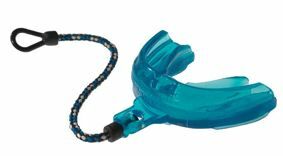 Mouth guards are the best way to avoid traumatic tooth injury and avoid expensive cosmetic dentistry procedures, so if your child participates in a contact sport in Pearland Texas and does not currently wear a tooth protection device, you may want to purchase an appropriately-sized mouth guard. They are available at most Friendswood and Alvin athletic supply stores. At David C. Montz DDS, PA & Associates – Family, Cosmetic and Implant Dentistry in Pearland Texas, we care about your child’s health and safety. To discuss your child’s dental condition or to learn more about sports-related tooth injury prevention, call us at 832-895-5120. We have been keeping Houston smiles healthy since 1997. Our child-friendly staff pampers our youngest Friendswood dental patients. Let us show you why we are not an ordinary Pearland dental practice.